Whereas the first instalment in this two-parter had Lucie brainwashed and hardly acting like her normal self, ‘Worldwide Web’ fortunately shows early on that Lucie’s individuality still very much exists and is fighting to escape from her captor’s mental confines. Sheridan Smith steals every scene that she is in, and she believably brings the turmoil of her attempted escapes to life wonderfully and provides the true emotion of the piece. That latter notion is quite surprising, however, as even with modern-day Earth under siege and on the verge of collapse, the story does little to actually show the implications of this to the everyday denizens or to the Doctor himself. In recent years, the Doctor’s morality has been put to the test in almost impossible situations that often feature the survival of humanity, but there is no such internal dilemma here and no sense of the scope of possession across the globe aside from a few throwaway lines. Still, it is quite satisfying to see how devastatingly and then heroically Goodman reacts to the news that the facets of his following he believed he had made up were in fact fed to him by the Eight Legs from the moment he found a crystal on a trip to Yorkshire. At the same time, it’s intriguing- if not wholly unexpected- to see the dissent within the Eight Legs’ ranks as the Queen tries to push forward her agenda of ruling the cosmos from behind the façade of humanity without full support of her own followers. Nonetheless, there is no denying that her scheme of using the stellar manipulator along with the crystals to create the most powerful hive mind in the universe is a frighteningly powerful one that certainly stands among the most unique the Doctor has faced. 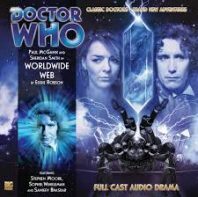 ‘Worldwide Web,’ perhaps realizing that it doesn’t feature nearly as much emotion as is typical for the range, does manage to instill some genuine feelings at its conclusion as the Headhunter must make the ultimate sacrifice in order to stop the advance of the Queen. This action is surprising in the worst way, though, since the Headhunter has shown no compassion towards humans in the past, but Katarina Olsson is superb as she fights against the Great One and ultimately proves to be unable to remember anything about her true self that may help her cling to life. It’s also worth noting that the fact that the stellar manipulator has been following the Doctor and Lucie through space and time ever since they left Orbis, while immensely satisfying narratively, also feels somewhat unrewarding since there was no hint of this at all through any of the previous stories. Obviously it’s unreasonable to expect that an aritificial sun would always be in sight of the two as they traveled, but hearing a prophesy or having something on a long-range sensor mentioned to intimate that something bigger lurked in the distance would have added needed extra weight to its appearance in this two-parter. Unfortunately, ‘Worldwide Web’ falls into the familiar trap of simply not being able to live up to the intriguing setup work of its first half. While the performances, direction, and score are as strong as always, there simply isn’t enough of an emotional backbone to compensate for what proves to be a rather straightforward tale, and it ultimately proves to be the second consecutive finale that fails to come anywhere close to the quality that the run of stories leading up to it possessed.